did anyone tell mom about his teeth? After hours of waiting for the surgeons to come out they finally do, Gage survived the surgery to remove his port, I collapse in a pile of tears onto the floor as they tell us, it was close and that they had to preform chest compressions on him twice during the procedure, but he is alive and we can see him soon. I am the first to see him. Outside of the PICU I hear “has anybody told mom about his teeth?” WTF? his teeth? At this point someone I don’t know who, comes up and tells me; “when we were intubating him his teeth were knocked out. The good news is we don’t think he swallowed them.” I swear to jeebus my first response was “do you know how expensive teeth are? I’m sending you the bill.” and then I’m laughing and crying because they could have knocked out all of his teeth and it would not have mattered as long as he is alive. I can’t hold him yet, but I sit and stare at him listening to the anestheoloist tell me how he let Gage come out of the anestisia by himself, and how he did so good, bla bla bla bla bla the rest is kind of a blur my mind was focused soley on my baby; who hours before was fighting for his life. During his second surgery Gages body was so bloated and puffy they could not find an vein to get the IV in, so they ended up using the femoral artery in his leg for an IV. 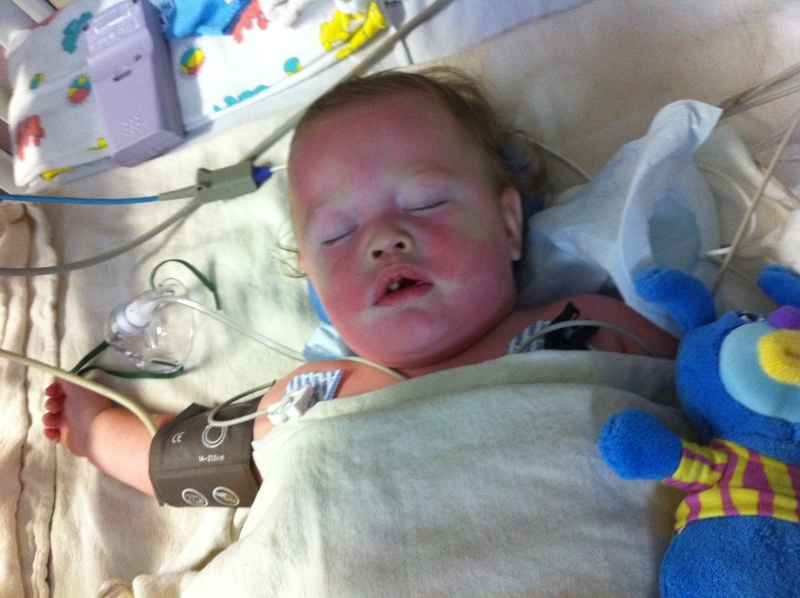 Gage also had a chest tube in place to drain the extra fuid from, yuck-o. I felt selfish, hogging Gage from his daddy so I finally left, and went back to Gages room where my sister, brother in law and father in law were waiting for me, (the twin had left to take care of her kids)they told me we would be moving closer to the nurses station, fine by me the closer to help the better. Gage in the PICU see, do you his SINGAMAJIG? I’m sorry if the picture is too graphic, but since I tell it like I see it and you keep coming back for more; you deserved to see it all. I have and will keep Gage in my payers every day, and pray that he beats this, and gets to go home with his parents where he belongs. We all need to see this miracle dear Lord let Gage be strong enough and fight and beat this and show that you are a powerful and caring God.